This report presents an updated critical review of literature on the value of the arts in clinical and therapeutic interventions. Two distinct strands emerged. Firstly, the impact of the arts in healthcare on patients and service users, and it provides a further updating the literature since 2011 to 2014, following Staricoff (2004) and Staricoff and Clift (2011). Secondly, it focuses on caregivers’ perceptions of the value of the arts in therapeutic and clinical interventions, by objectively: exploring the impact of using the arts on healthcare professionals; examining the perceptions of caregivers on the use of the arts in enhancing health and well-being in these settings; and assessing whether engaging with arts activities in the workplace may have the potential to improve self-esteem and so reduce staff turnover. The report lists a number of key findings of real value to researchers, noting that many countries and cultures across the world are using, or experimenting with, the use of arts-interventions in healthcare settings. Bungay, H., Munn-Giddings, C., Boyce, M., & Wilson, C. (2014). 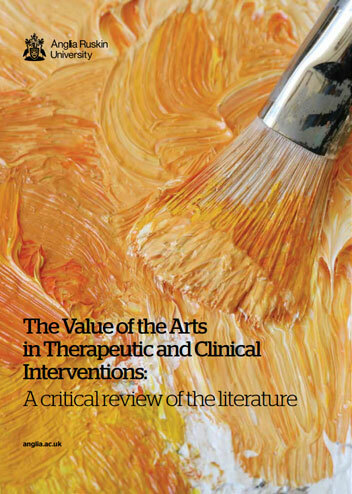 The value of the arts in therapeutic and clinical interventions: a critical review of the literature. Cambridge: Anglia Ruskin University.